Holiday.gr - Kolibithres, a trip to a myth! In the west side of Naoussa's cove, is located the beach Kolibithres. It's the most famous in the island. Its name is due to this special shape. It is surrounded by rocks and creates a natural baptizing tub. Really impressive are the rocks made of granite, carven from the waves that create extraordinary shapes and look like natural sculptures. Beach Kolibithres, is organized (it has umbrellas and sun beds) and because of its exquisite beauty, is a center of attraction for Greek and foreign visitors. There are a lot of restaurants and cafes near the beach. 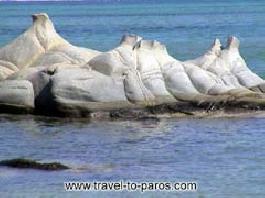 You can visit Kolibithres by boats that tour around the island and make a stop in this beach, or by car. Been to Kolibithres ? Share your experiences!